The Pirelli PZERO Corsa Sys Dir tire is a system street able track and completion tire made for those who drive super sports cars that are high powered and made for extreme road use. They are also suitable for track use and lapping days at a driver’s school. They are the original equipment tires for the Ferrari 360 Challenge, The Porsche GT2 & GT3 and the Lamborghini Gallardo road versions. The Pirelli PZERO Corsa Sys Dir tires were made to providing the best dry handling, wet traction and noise control a driver of a high performance sports car could want. This tire truly enhances the racing performance of the cars it is used on. The PZERO Corsa radials are made to meet DOT specifications but they are not recommended for driving on wet surfaces where there is standing water as the risk of hydroplaning is too high in such instances. They are also not suitable for driving in conditions where the temperature is close to freezing and should not be driven through snow and ice. These tires must also be stored indoors where the temperature is at least 32 degrees Fahrenheit. The Corsa DIR tires are suitable for the front axle since they penetrate water surfaces better and then leave a clear path for the rear tires to go through. 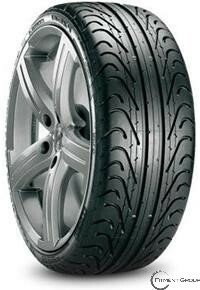 They mold the innovative racing tread compound by Pirelli into a V-shaped slick directional tread design.